Struggling to find that perfect tweezer for quick brow touch-ups in between waxing/threading appointments? Struggle no more. 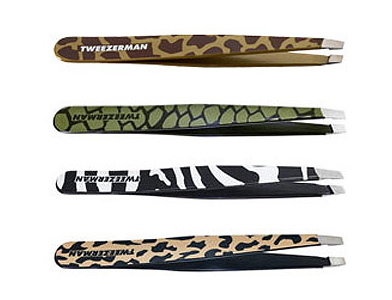 If you haven’t yet discovered the original, award-winning Tweezerman Slant, your life is about to change. The perfectly aligned, hand-filed tips are slanted to grab every hair, every time with the smoothest, true precision. Available in a fabulous range of colours & wonderfully kitsch animal prints. I’ve heard they sell them at Dis-Chem in South Africa, although I bought mine a year or so ago in London (at the Selfridges Beauty Department). You will never use another tweezer. Awards Allure Best of Beauty Award for the last 10 years; InStyle Best Beauty Awards from 2001 to 2005 and 2007 to 2010.